Yesterday, I went on air with Emily Chang at Bloomberg West to talk about the impact of public stock market volatility on the financing options and liquidity for startups. Today we’re releasing the initial version of the Mattermark venture funding index, to simplify communication of the health of the startup funding ecosystem. 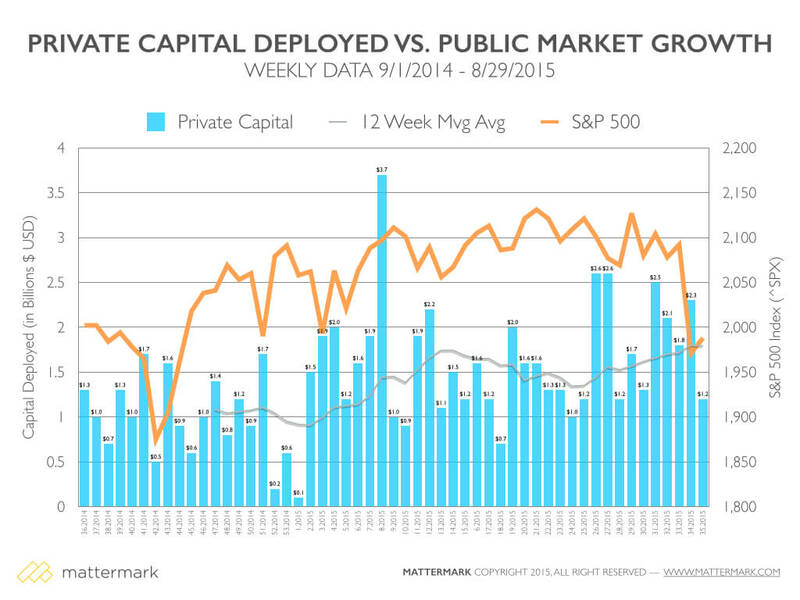 In researching the creation of this venture funding index, there are two graphs that provide insight into the impact of public market movement on private financings. To simplify communication, indices like the Dow Jones Industrial Average and Standard & Poor’s 500 have been created in the public markets, using various methodologies to help people easily talk about overall market movement. For now, rather than abstracting away the actual numbers into a weighted index (something we might want to do down the road to balance out the various funding stages) I will be reporting on the raw numbers and exploring the relationships between the public and private markets. 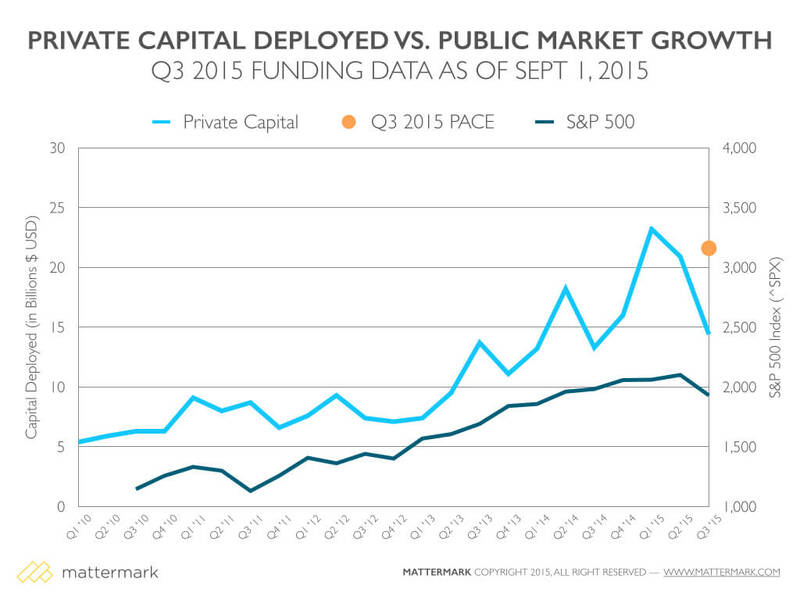 The graph above compares five years of quarterly movement of the public market, through the lens of the S&P 500 Index, with total U.S. venture funding allocated to private companies in the respective quarters. To help us zoom in on more recent market movement, I have also created a weekly view of the same information, along with a 12 week moving average to help visualize the trend. Methodology Notes: ^MVPX is not yet recognized as a ticker symbol by any U.S. or foreign equity exchange. Private funding events are rarely disclosed exactly when they happen. Where possible, we have used dates provided on regulatory filings, however the majority of funding events are recording as news announcements and may take place weeks or months after the funding has closed. Aggregate numbers for past weeks may change slightly as new information is learned. For the most up-to-date information, we recommend creating a free trial of Mattermark Professional where all this data and much more is available for download to power your own analysis.